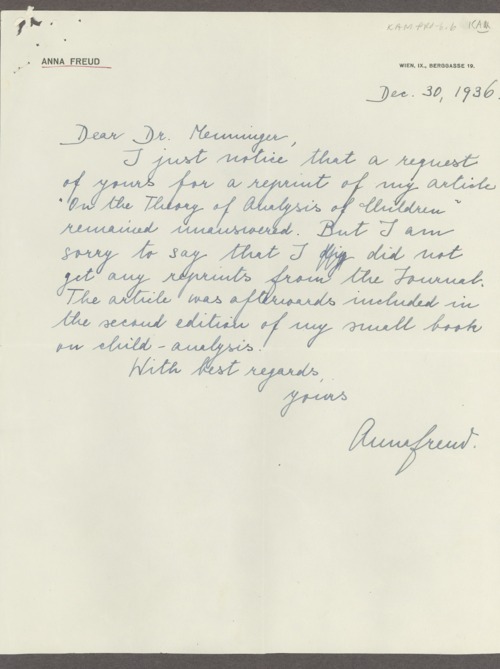 These are handwritten and typed letters, mostly outgoing, from Anna Freud to Karl Menninger, Rudolph Ekstein, May D. Lee, and other Menninger Foundation staff. Anna Freud was the youngest child of psychoanalyst Sigmund Freud. Topics include publishing and requesting reprints, visits (or apologizing for not visiting), professional organizations and conferences, comments and critiques on writings, family deaths, and greeting cards. Anna Freud came to the Menninger Clinic in Topeka on multiple occasions during the 1960s. These papers are part of the historic psychiatry material in the Menninger Archives.